The Turkish government has now fired more than 4800 academics from universities in a series of five emergency decrees issued between September 2016 and February 2017. The decrees follow the failed coup on 15 July that left more than 200 people dead. On top of this, over 200 students have been expelled and 15 universities closed down, according to the international academic freedom network Scholars at Risk (Sar). ‘Outside of these sweeping government orders, it is clear that hundreds of scholars and university personnel have been detained, arrested and named in arrest warrants, mostly on suspicion of alleged connections to Fethullah Gülen [the opposition leader accused of promoting the coup],’ says Daniel Munier, a spokesperson for Sar. Organisations providing fellowships abroad to threatened researchers have registered an increase in requests from Turkey. ‘We’re now seeing 60–80 applicants a month from Turkey alone,’ says Munier. However, many could not join their programmes because the government is in the process of withdrawing the passports of some of the indicted academics. The Turkish Academy of Sciences and the Turkish Council of Higher Education did not respond to Chemistry World’s requests for comment. The academic crackdown is part of the firing of tens of thousands of public employees, including administrative personnel and school teachers. In the meantime, more than a hundred journalists have been jailed and tens of media outlets closed. At the political level, the prosecution has centred mainly on members of the pro-Kurdish left wing opposition Peoples’ Democratic Party. Affected academics include scientists like Serkan Gölge, a Turkish–American physicist and Nasa contractor based in Houston, who was jailed in July during a vacation to Turkey. Sociologist Latife Akyuz fled the country illegally, because her passport had been withdrawn, after she was suspended from her position at Düzce University and hounded from her home by death threats. Mustafa Sadık Akdağ, an assistant professor of dentistry, committed suicide in February, after being indicted and interrogated. ‘We have been dismayed by reports of denied access to legal counsel, visitation rights and – most distressingly – allegations of ill treatment and torture,’ says Munier. ‘The only term I can use [to describe the situation] is purge,’ says Laurie Brand, chair of the Committee on Academic Freedom of the US-based Middle East Studies Association. ‘The coup attempt has given President Erdoğan the ammunition to crackdown on people that, while not supporting Gülen, have been for years critical of Erdoğan,’ says Eugene Chudnovsky, co-chair of the US-based Committee of Concerned Scientists, who compares the situation with that of Germany in the 1930s, China in the 1960s, or Chile in the 1970s. ‘Many of the people targeted do not have the faintest links to the aborted coup,’ says a retired Turkish physics professor, who does not wish to be named and is also a member of the organisation Scholars for Peace, which published an open letter condemning military action in the Kurdish region of the country in 2016. 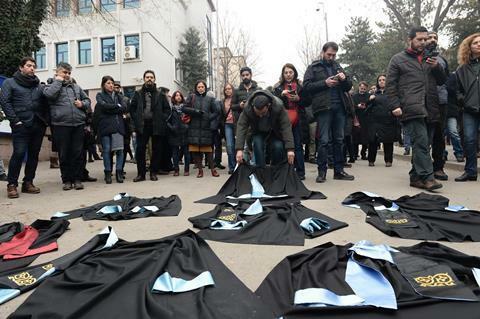 More than 300 of the 4816 academics removed by emergency decrees belong to this organisation, and over 2000 of them are members of Egitim-Sem, the major progressive education union in the country, according to sources close to this organisation. ‘The presumption we have is that many of these people will be replaced by supporters […] it’s a way of the state to initiate a new cultural project,’ argues Brand. In October 2016, Erdoğan secured more say on the appointment of university rectors. The federation of European academies of science – who ‘strongly condemn[ed] […] the repressive and excessive nature of recent measures [in Turkey]’ in a public statement shortly after the coup – will vote in September on the full membership of Bilim Akademisi, an alternate science academy created in 2011 in protest at government interference. The disagreement between Erdoğan and the secular scientific community is much older than the coup and became more heated months before it occurred following the Scholars for Peace open letter. While the president has received some support from the academic community, those opposing his policies are now organising. Academics in Ankara have set up an open-air university called Street Academy. And the New York-based grassroots organisation Research Institute on Turkey has launched a crowdfunding campaign to help affected Scholars for Peace members. However, Brand says that little can be done by the scientific community alone. ‘Europeans would have many different instruments [to influence Turkey] but the refugee issue is being used [by Turkey] as a weapon to make a deal with the European Union,’ she says. Now all the academics concerned can hope for is a ‘no’ vote in the upcoming constitutional referendum that would increase the powers of the president.